The latest organisations to join the Go Ultra Low Companies scheme, including OVO Energy, Oxford City Council, Santander UK, Swansea University and Gatwick Airport have pledged that EVs will make up at least 5% of their vehicle fleet by 2020. More than 100 other companies have already joined the Go Ultra Low initiative such as, Britvic, London Fire Brigade and Microsoft UK. 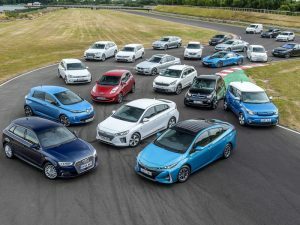 However, some companies plan to go beyond 5%, for example Santander UK who already operate 57 electric vehicles in their fleet and, according to the bank, have plans to expand this to 10% of its 1,400 vehicle fleet by 2020. Meanwhile, Oxford City Council says that 7% of its total fleet will be electric by the end of the decade, while OVO Energy has already switched more than a fifth of its vehicles to plug-ins. A Go Ultra Low survey conducted in November 2016 concluded almost 700,000 UK motorists would switch to electric if given the opportunity by their employers. However, at the time, the survey found only 25% of businesses offered electric vehicles to employees. According to figures provided by SMMT, registrations of EVs to both private and public sectors accounted for 65% in the first half of 2017. 22,480 electric cars were registered across the UK between January and June 2017, a rise of 14.3% on 2016 and 53.8% up on the same period in 2015. EVs are proving most popular in the UK’s largest urban areas, including the West Midlands (2,704), Great London (2,477) and Cambridgeshire (1,928). The greatest year-on-year increase occurred in Greater London with registrations up 68.6% on the first half of 2016.